In August, 1977, I spent a fine afternoon visiting a trout farm outside of Zagreb, Yugoslavia with an adjoining restaurant. Over Christmas, my family had a slide show that included the trout farm. I have to admit a languid pool of water with a restaurant next to it seemed much better in my memories than the photos. Only in the last year did I learn we had a trout farm with restaurant in our region via The Fishermen's Inn in Elburn, Illinois. On the spur of the moment, I found myself meeting friends at this restaurant without benefit of preplanning or a map. The address is on main street, which is the name of the street on the main drag through Elburn. Unfortunately I wasn't finding the Fishermen's Inn. My friends called to inquire where I was, I told I was nearby on Main St looking for the restaurant. They told me unincorporated Elburn has a second Main St, which is a few miles south of town on Rt 47 (due west of St. Charles). I arrived to Fishermen's Inn just after it opened at 3 PM on Sundays. The restaurant is in a barn flanked by two large parking lots and several trout ponds in the rear. We were seated at a window overlooking the ponds. These looked as lively as those pictures from long ago, except for several pairs of swans patrolling the area. Only a bit later did I realize the bread was a homage to the swans outside. When in Rome, do as the Romans. There was no reason why not to have trout, when it could only be the freshest fish possible on the menu. There were two preparations for their whole trout: broiled or fried in oil. My favored preparation for trout is fried in butter or a butter-oil mixture. I was disappointed to find the trout cooked in oil, thus I opted for the broiled fish. Once your fish is brought to the table, you have the option of having your fish whole or fileted tableside. I opted to keep it whole because I enjoy pecking out the cheek meat and nibbling on the tails if they are crisp. My friends opted to have their fish fileted, which was recommended because trout has bones. I was looking forward to the tableside fileting presentation. In Europe, where being a waiter is a profession, they make fileting a fish tableside an occassion. The waiter using a knife and serving utensil quickly slides a knife against the fish frame and lifts the filet to your plate with elegant precision. Unfortunately at Fishermen's Inn there is no tableside presentation. Instead the waitress slipped on latex gloves and was found quietly fileting the fish in the corner as if a bit uncertain of her skills. The broiled trout was certainly fresh and sweet tasting, I did miss the butteriness I associate with eating trout. If I ordered there again, I might inquire if they might consider a butter-oil preparation or at least an oil-garlic-parsley finish to the broiled trout. I will certainly go again, though I will be a bit more assertive in getting the trout prepared to my tastes. They may not necessarily accommodate me, though I think it is worth the effort to try. Open Mondays Memorial Day Through Labor Day. Just to correct your directions, Fisherman's Inn is on Main Street but it is Main Street of Batavia and is directly due west of Batavia. I have eaten here for many years as this is my backyard. My last visit was in October and two at my table had the trout which was fileted right a long side us at the table, perhaps you had a new server because our was done very expertly and right in front of us. For what it's worth, I enjoy their smoked pork chops and they have many good things on their menu. Also of note ( and I know we covered this is a long thread about places around Geneva/Aurora) the Fisherman's Inn is across the street from Blackberry Inn which has great breaded pork tenderloins and ruebens. Thanks for clearing up the instructions. I just wanted to make sure people weren't going crazy driving up and down downtown Elburn like I did for a few minutes. I finally got to see the Elburn Meat Market, which I have heard great things about. I'm glad you had the tableside filet service. Did you get your trout cooked in oil? If yes, what did you think? I'm sorry that I forgot to compliment your excellant photos, the escargot looks great. Fisherman's Inn is a beautiful setting, in the right season, hummingbird feeders are hung outside those big windows and provide quite a evening show along with watching the swans. You know, in all the years I have eaten at Fisherman's Inn, I have never had fish! I love their smoked pork chops and usually have that, a steak or the lamb chops. My friends however enjoy the trout, I just always assumed it was prepared in butter. Do come back sometime in nicer weather when you can walk the grounds after a meal, it's really a pretty setting! I eaten there quite a few times and it seems like they always did the tableside filet for both the trout and catfish. Cogito wrote: I eaten there quite a few times and it seems like they always did the tableside filet for both the trout and catfish. I'm glad I just hit it on a new waitress. I have friends who live no more than 10 minutes away, who came with me. They hadn't been at Fishermen's Inn in 18 years, though now they intend to be regulars. They have live in the area, but never this close before. Thanks for the comments on the pictures. The hardest was the trout because night was falling fast. I had to tweak it a bit to make it less forboding. My local newspaper reported this morning that Fisherman's Inn has closed. It had been in business since 1964 with closure for a while due to a major fire about 10 years ago. It was a very popular spot for special occasions due to it's lovely setting amongst the fish ponds. Apparently the owner died a few years ago and the current management trust ran into problems with the bank. thats too bad, great location and concept they had there. With that said, the food on my visits was average and costly. I was there several months ago. The banquet halls downstairs were busy with weddings and class re-unions. Upstairs was a different story: dead. Our late lunch-early dinner was dismal and pricey for what they presented. I was with a friend who loved it for the memories it brought back. However, trout served with a chocolate sauce and strawberries just didn't sit right with me. He professed to love it. I just kept my sweet mouth shut. Too bad it seemingly lost its way. So often after an owner dies, a place looses it's way. It was great back in the day, say 10 years ago. Cathy2 wrote: Upstairs was a different story: dead. Our late lunch-early dinner was dismal and pricey for what they presented. I was with a friend who loved it for the memories it brought back. However, trout served with a chocolate sauce and strawberries just didn't sit right with me. He professed to love it. I just kept my sweet mouth shut. The last two times I tried to eat there, the wait was an hour on a Saturday night. I passed. My two visits were on Sunday afternoons. Would have loved to have witnessed its hay day. I have dined at trout farms in Europe where you dinner was harvested after you ordered. I went there hoping for such an experience. Wouldn't it be great to be able to go to a place for dinner that harvests trout from its own grounds only hours before you eat it. 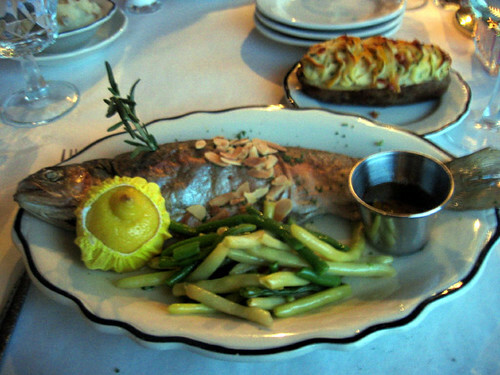 The trout would not only be fresh but every order would be simply prepared and fileted table-side. An accompaniment to your delicious locavore meal would be the most breathtaking views of rural Illinois countryside through the gigantic picture windows built into the side of the restaurant, a giant renovated red barn. After dinner you could take stroll through the restaurant grounds, among it's ponds and can feed the very trout that fed you moments before. Fishermen's Inn was something very different to me 20 years ago as a 16 year-old kid who needed a job and thought that a great restaurant like this would be a great place to get some kitchen experience. I knew I wanted to go to college but I thought what better way to earn some spending money than by doing something that I love--cooking. Well, people must have been trying to tell me something and to this day a little part of me asks myself if I should have listened to them. When I applied for a cook's position at Fishermen's Inn, the chef told me I was crazy and asked me why I would to ruin my life by becoming a chef. Maybe he was right? The owners of two other restaurants I would work at before I actually made it into a kitchen somewhere told me the same thing. So, I did what I always did growing up, I listened to my elders and I ended up doing the opposite of what I wanted. At Fishermen's Inn ended up working as a busboy. This wasn't my time to start in the kitchen I thought but I never gave up and kept my eyes open to whatever I could peripherally learn from about the kitchen and the food. We've all got to start somewhere and I'll say that starting as busboy was an incredible introduction to the restaurant world. To this day, this job was one of the most humbling experiences of my professional life. When I started there it was a VERY busy restaurant. Talk about being thrown to the wolves--that's what happened to me. My very first task was to bring a tray of wine glasses from the kitchen and bring them to a waitress who was buried with tables. Alright, I thought, I can do this. I grabbed a tray, headed to the glassware and proceeded to pile wine glasses on to the tray, no big deal. Except, that is, if you believe that wine glasses should be stacked upside-down on the tray. I headed out to the dining room with my tray of upside-down wine glasses and made it as far as the grand stone fireplace in the middle of the room, turned the corner and watched as every single glass cascaded from the tray and shattered all over the floor and all over the fireplace. The place was chaotic and I had just thrown a wrench into any semblance of order that may have existed at that moment and knew that my job would be anything but easy. But the job did get easier. I started to get it down. I was fascinated with the way the kitchen worked, the way it smelled, with the ease by which the servers cleaned the trout. I even began to enjoy dealing with the customers. My job as a busboy was very limited and I didn't interact much with the guests but I did as much as I could to "make a difference" in their experience. In fact, I became so good as a busboy that I quickly earned the honor of being assigned to a regular waitress. I saw this as a great sense of accomplishment, I was proud and that meant I could expect a regularly higher payout. It seemed like I was always learning something at Fishermen's Inn. In addition to learning the workings of a professional kitchen I also learned what a hell hole of a place the kitchen could be. The guys on the line were sweating, shouting and cursing all night long. There was a service bar inside the kitchen itself which I thought was pretty interesting even back then. The bartender was a nice guy who talked and moved at his own, "special" speed it seemed. One night, there things got heated in the kitchen and the chef picked up a steak off a sizzle platter and with his tongs, threw it at the bartender where it hit his bar arm and left an immense blister. 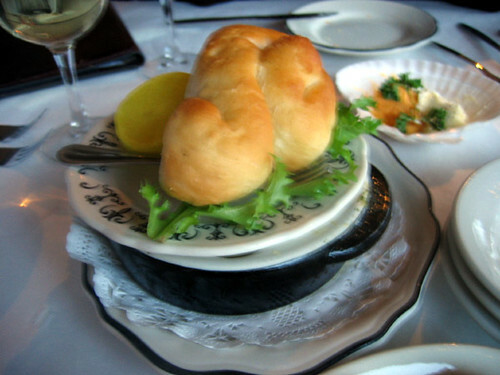 Another interesting element within the kitchen was a bread steaming device that I just so happened to be describing to my wife this past weekend while dining on hot dinner rolls. Not to stray but there's just something about hot bread that I don't like. If bread is fresh, it shouldn't have to be heated up. Unless! 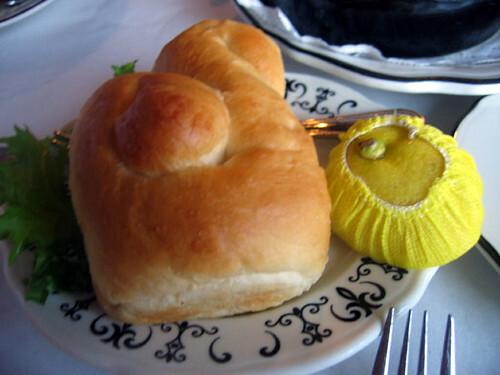 It's the little individual loaves that they served at Fishermen's Inn. They were literally tiny, unsliced loaves of white bread that would impaled on prongs that delivered a blast of steam into the bread heating it up. The hot loaf of bread was delivered to the table on a mini cutting board with a bread knife and accompanied by a series of scallop shells that had honey butter, whipped butter and whipped cheddar cheese spread. This was a signature of the restaurant and the steaming machine, as you could imagine, delivered one hell of burn if you messed up. There was a also a "real" garde manger station within the kitchen. By real I mean, the pantry chef wore a floppy chef's hat and made everything from the desserts to the salads and dressings and the flavored butters. Yes, those same butters that went with the bread but also the dill butter that was offered along side the whipped butter, sour cream, bacon bits and chives that made up the "baked potato caddy." I had my first "family meal" at Fishermen's Inn. I remember the "captain" aka boss lady, telling me that it was customary to come to work a half hour early to eat a meal. Free? I asked. Yep, free. This was pretty cool I thought. So, I'd come to work and sit with the other busboys and the servers would all sit together, the cooks would all sit together and the dishwashers would all sit together. Some people would sit by themselves, away from everyone else, just like a real family. 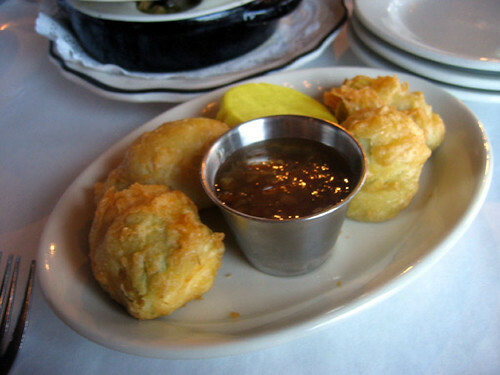 I recreated my first restaurant dish while working at Fishermen's Inn, Shrimp de Jonghe. I was addicted to this dish and would order it and pay for it sometimes after work. I remember seeing the gigantic clear cambro tubs of the bread crumb, garlic and butter mixture back in the kitchen and thought about how great it would be to make a recipe on that scale. In fact, I would on occasion, dine at the restaurant, by myself, because I wanted to try some of the things that I would see served to the customer every night. One night, I sat at a table, by myself and ordered the duck a la orange. My server whispered in my ear, "are you sure you want that? Duck is so greasy." Bring it on I said. Or something to that effect. How incredible was this, I thought, a whole half of a duck to myself. The crispy, burnished skin, the tender meat, the wild rice pilaf, I finally got to experience it for myself. And I did, and I enjoyed it. At this meal I also wanted to enjoy something else that I saw quite a few of at the restaurant, a frozen grasshopper. I thought it would be a great dessert. I ordered it and got kind of funny look from my waitress. When it arrived my waitress got a funny look and talking-to by another waitress. That's when I realized that there was alcohol in the grasshopper. Yes, I was a little naive and admittedly, a little dumb. I'm still working on both of those. Fishermen's Inn was a special place to me. It was special to a lot of people because they may have gotten married there and partied the night away. There was a real Maitre de as well. A Perry Mason type who "walked quietly but carried a big stick" kind of guy. He made the guests feel special and the staff made him feel special so that in turn, he'd be special to the staff. There was a little machine in his office that stamped out the names of every single reservation onto a matchbook with a drawing of the restaurant on it. Every night, matchbooks were stamped out and placed on every table as a keepsake. The matchbooks carried a lot of weight too. If my mom and dad brought one home, I knew that they had had a nice night or had been a part of someone else's. I went on some of first dates with coworkers here which thinking back on had to have been some of the most embarrassing moments of my life. I did things that sixteen year olds aren't supposed to do and their parents aren't supposed to know about in the parking lot after work with my coworkers who had become my friends. Like I said, Fishermen's Inn meant something very different to me twenty years ago. Even though, it's closed now, the fact is, it shaped me. And there are things about it that were very special and ahead of its time. I eventually became a chef. But I'm still on a journey. I look back on Fishermen's Inn and think about some of the things that were so memorable about it like being in an old barn, like being on beautiful Illinois countryside, like harvesting its own fish and serving them with the heads still on, like having a real chef-driven kitchen. I look back on these things and think, isn't this what I and other like-minded Midwestern chefs and diners would love to have or be a part of? Could this be like Chicago's Stone Barns or Napa Valley (without the wine)? It's not so unrealistic to think that I could see myself revitalizing the very place that I started at! Why did it fail? I don't know. I know that it had suffered a pretty serious fire. It reopened but wasn't as successful I guess. It may have undergone ownership changes. I know for a fact that food became "unmemorable" or just plain not good. Of course, the economy tanked and those ripples are often felt more the further they get from the city. But, the restaurant had been around for quite a while when I got there and that was twenty years ago. Restaurants are luck to last 5 years. But I know a lot more these days. I've not only learned how to cook but I've learned the business of running restaurants, have learned what good food is all about, have my finger on the pulse of what many diners are looking for, understand the power of marketing and getting people excited about something that they can believe in. So, I ask, could a restaurant like this be reborn, modernized and function as a restaurant built around "sustainability" and local produce from nearby farms, orchards and pastures? Is it reasonable to think that if done right, it could be a profitable restaurant that serves its local clientele but also draws a destination crowd from Chicago and suburbs? Would people be willing to travel an hour or more to get there? It's time for the Midwest to be seen as just as much of an inspiration as other places in America for it's incredible rural beauty and the bounty of good, real food that is produced by generations of it's farmers. If a place like this doesn't have the chance to be part of this vision which I know many others share, then I don't know what does. I don't mean to fixate on this place as if it is the only option for such an idea, just whether or not it could be symbolic of my idea--this big idea that like-minded people share. But seriously, if anyone is interested in finding out whether or not it's for sale and has a similar "ideology", let me know! I'll head out there with you and maybe we'll make something hapen. just figured out that when I worked there it had been open since 1964 or for 26 years. It held on for another 20 years after that. Fisherman's Inn was a memorable place. As a native Auroran, my first visit there was in 1969, when working at my uncle's electrical shop the summer before going to college. He took the whole shop and I got served a couple drinks (was 18). We had great camaraderie with the guys, great view of the sunset over the ponds, fantastic meal, great service, nice ambiance, got a little tipsy……just memorable. Went away to college and every time I came home with a new girl friend, we ended up out there. It was just far enough off the beaten path with interesting surroundings, fine food, good drink, sunset over the ponds……..memorable. Got married a few years later and had an engagement party out there. Service was great, food superb, nice venue…….memorable. Made an offer on a house in Sugar Grove in 1980. Was at Fisherman’s and got paged. The realtor called to tell us we had gotten the house. Now it was just a couple miles up route 47, so the visits increased. Went there to celebrate birthdays with the kids, the parents, the grandparents…... more find memories. Fast forward to 1985 when we moved to Burr Ridge. Told the neighbors about Fisherman’s and went there with a bunch of neighbors at least once a year for 20 years. Everyone loved it and marveled at the food, the ambiance, the service, the too many drinks………more great memories. Spent a lot of time internationally in the past five years and the visits to Fisherman’s stopped for a period – just always gone and could not find the time. Finally called up Mom and Aunt Katie around Christmas of ’08 and went there with them, wife, and daughter who had just graduated from grad school. Planned a big celebration but the bloom had come off the rose at Fisherman’s; food was mediocre, service was marginal at best, didn’t have the steamed bread, ambiance was off, place looked a little dirty. We were all disappointed but thought maybe it was just an off night. I’m sorry to find out it was the LAST night for us. It was a sad note to find out the place is gone for good. Forty years of going there with fond memories gone with a thud. So, if you see this post, chef above, I reminisce and commiserate with you. I share in your sense of loss. For us it was more than a place; it marked moments in time, events, celebrations, rites of passage. It was more like a friend. Forty years of friendship now gone, but never forgotten.